One day this week, I walked to the bus stop with my four children. It was raining so hard that our umbrellas were not enough to keep us dry. My oldest two children hopped on the bus leaving the little ones and I to walk home. All of us were damp and I was cranky by the time we got back to the house. 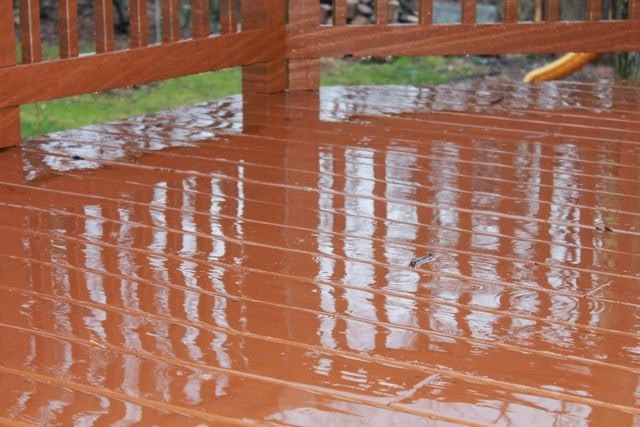 I looked out on the deck and I saw this. Yuck! Wet! 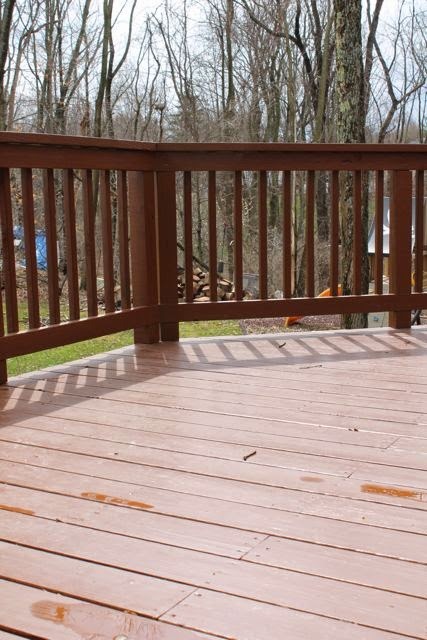 We needed something fun to do, but since warmer temperatures have arrived everything fun happens outside, not inside. What we needed was an author birthday celebration! Thankfully, the day before we loaded up on books by Gianna Marino at the library and I had an idea that I thought could lift our spirits on this dreary day. Gianna Marino is the author and illustrator of five books children including Meet Me at the Moon and Following Papa's Song. When Gianna was little she was quiet, wore her crayons to nubs in kindergarten, and her mother made sure she was enrolled in every possible art and dance class. She enjoyed caring for her animals (chickens, rabbits, birds, and more) and riding horses more than playing with toys. But, when she did play with toys she would entertain her friends with her storytelling. Her storytelling and love of animals came together in high school when she got a job as a carriage driver and told stories to the riders. (Mazza Museum Keynote). After high school she decided college wasn't for her. She started traveling all over the world and wrote for travel magazines. She feared working a real job, but she needed money to fund her trips. 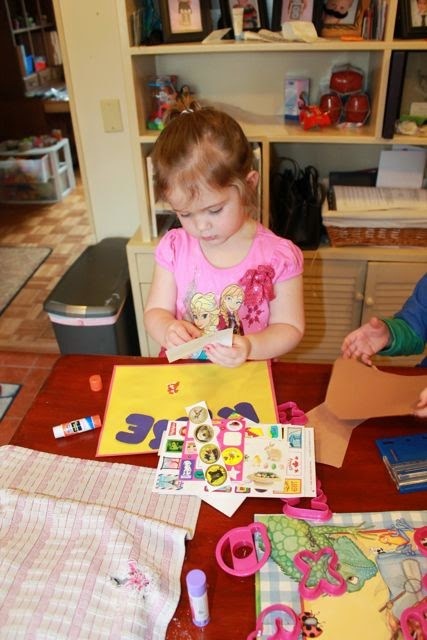 She took a job designing gifts and tchotchkes which led to another job designing toys. Gianna was doing exactly what she didn't want to do. So, she took the class "How to Illustrate a Children's Book" at UC Berkeley to break free from the confines of her job. 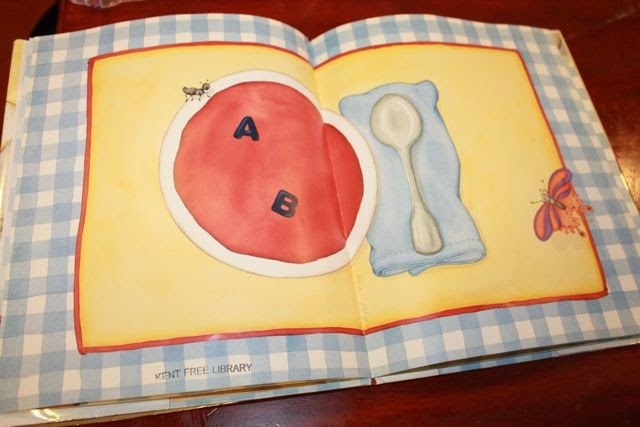 While taking the class, she was given an assignment to illustrate the first page of an ABC book. She said, "I couldn't think in one-page thoughts, so I had the idea for the entire book which turned into Zoopa: An Animal Alphabet five years later." (Seven Impossible Things). 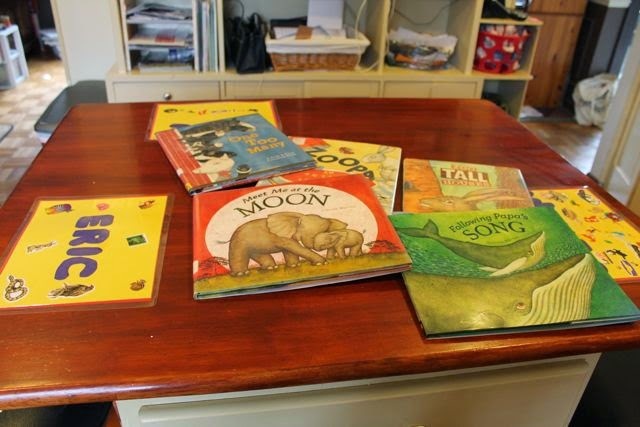 Not only did Gianna have the idea for her first picture book while taking this class, but she met many other writers who worked together and supported each other on their road to becoming published children's book creators. After the initial success of Zoopa: An Animal Alphabet and her second book, One Too Many: A Seek and Find Counting Book, Gianna struggled to get a third book acquired for publication. She examined her art and tried to develop a new style that incorporated much more emotion. "I started painting animals from my trips abroad with intention of finding emotion in each one. As I painted, I would think of someone I knew and mimic their facial expression in my paintings." (Seven Impossible Things and Mazza Keynote) After lots of experimenting she developed a technique of applying layers of gouache to rice paper that was soaked onto watercolor paper. She used this style for Meet Me at the Moon, a story that she wrote the week she learned her mother was diagnosed with cancer. Gianna followed up Meet Me at the Moon with Too Tall Houses and Following Papa's Song. Her next book, Night Animals is set to be released in July 2015! 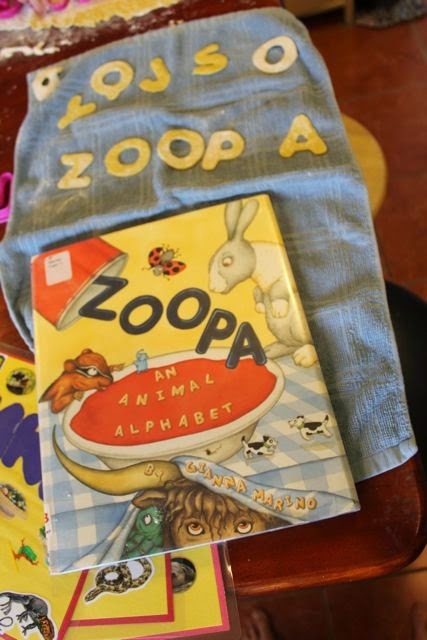 The day my daughter and I loaded up on books by Gianna Marino at the library we came right home and read Zoopa: An Animal Alphabet. This wordless alphabet book grabbed my daughter's attention right away. Each page has the view of a bowl of soup on a place mat. 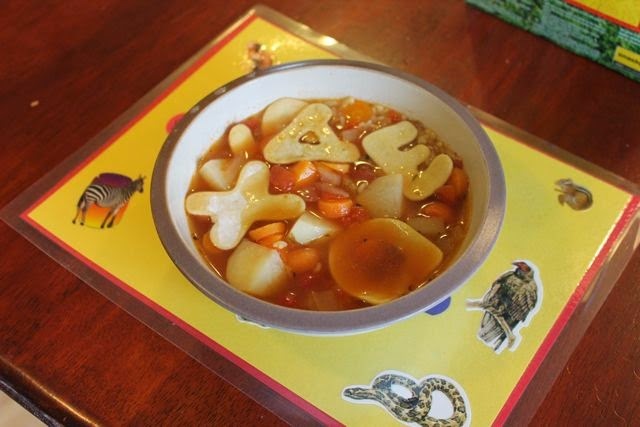 Each letter of the alphabet is presented in the bowl of soup, first two at time and later three at time, and an animal appears that begins with the letter; a for ant, b for butterfly, etc. Each turn of the page brings more animals until you think there can't be room for one more. But, Gianna saves a big splash at the end with letter Z! The only things that sounded good to me on the rainy day were having was a bowl of alphabet soup and reading books with my kids. We started reading Zoopa, one thing led to another, and before we knew it the morning was gone. 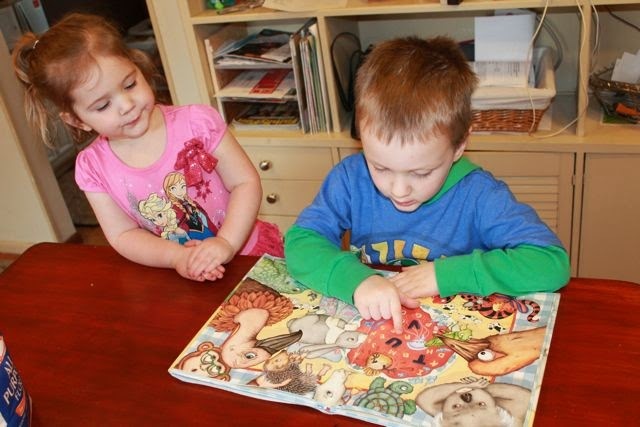 To start the morning my daughter read Zoopa: An Animal Alphabet with her brother. 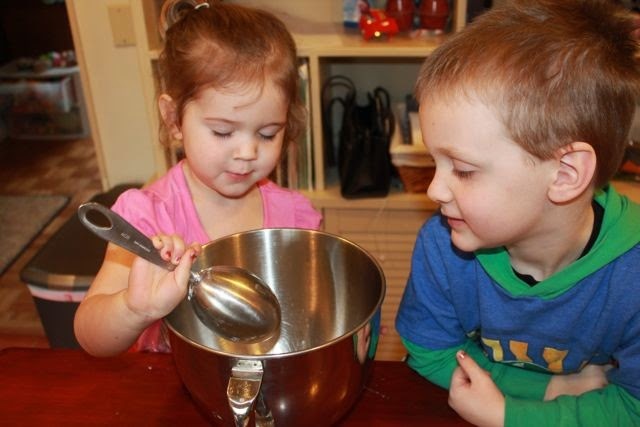 After reading, I said, "Let's make some noodles." 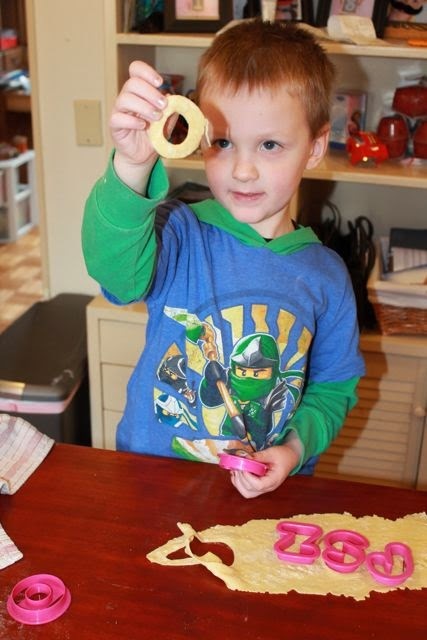 We had alphabet-shaped noodles that we bought from the grocery store, but I thought it would be fun to make our own egg noodles. We used a recipe for egg noodles from Food.com. 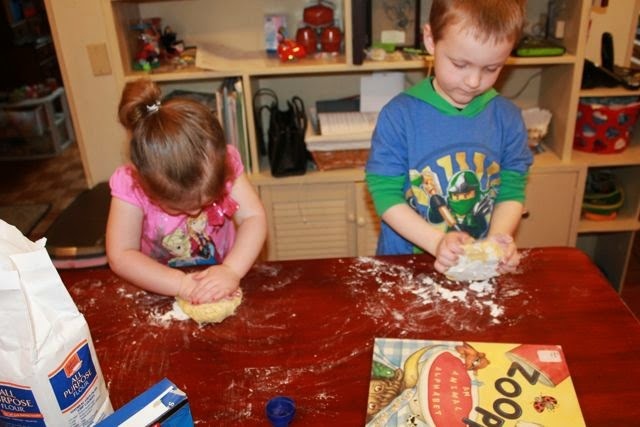 After kneading, the recipe suggested letting the dough rest for at least 10 minutes. This gave us time to work on another project. 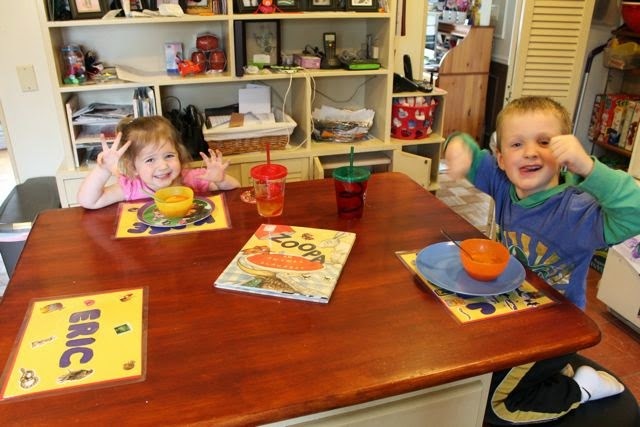 I thought it would be fun to make place mats for our lunch. 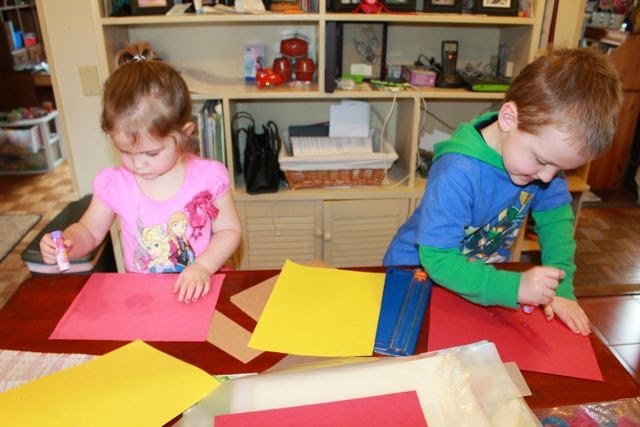 We used red and yellow construction paper to recreate the place mat from Zoopa! 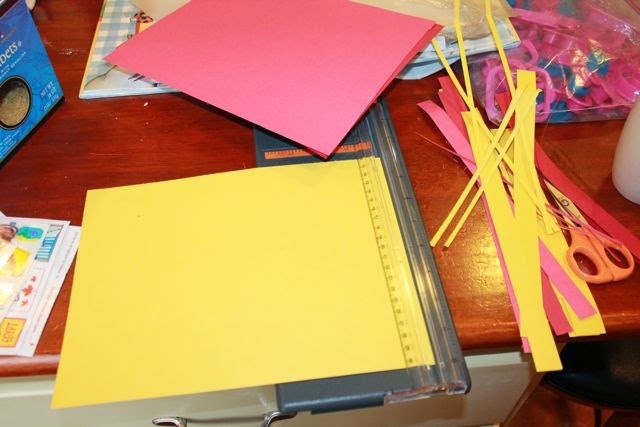 I trimmed the yellow paper to be slightly smaller than the red. They glued the yellow piece of paper onto the red. After making our place mats it was back to the noodles. 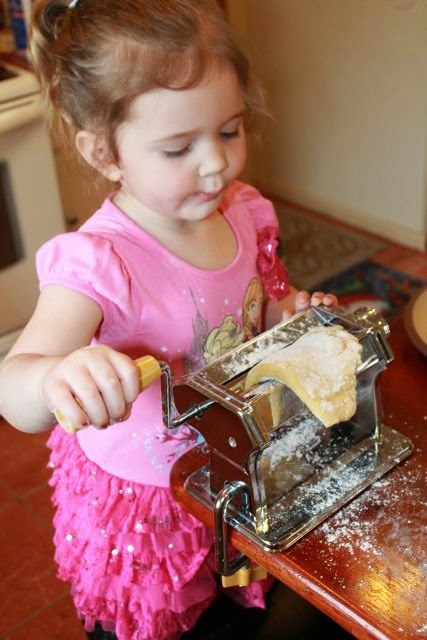 My daughter used our pasta machine to make the dough really thin. 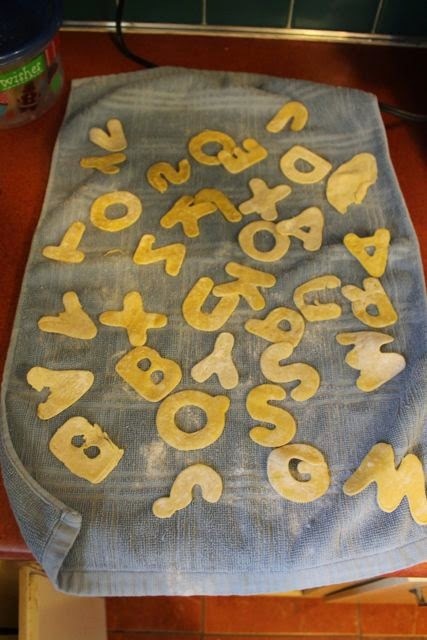 We used our letter cookie cutters to make the alphabet noodles. 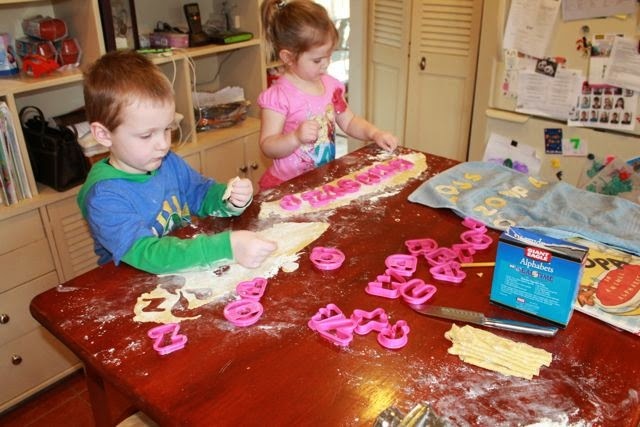 They worked so hard to make their noodles. We let the noodles dry for a over an hour while we made our soup. While the soup simmered we read all five of Gianna Marino's books! 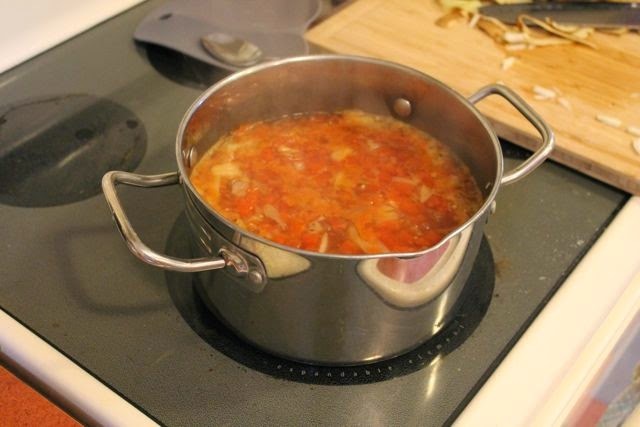 Hooray for soup on this rainy day! Our alphabet soup had the big egg noodles we made and little ABC noodles we bought at the store. It was delicious! 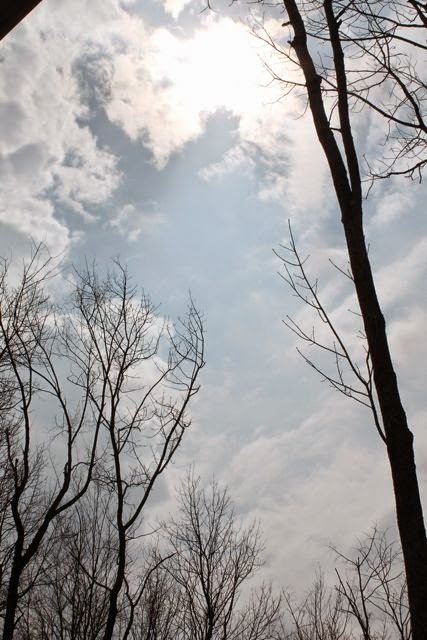 Amazingly, after lunch the rain went away and the sun was shining! The soup, crafts, and good books brightened our day! Gianna, we hope you have a wonderful birthday that is filled with good food and sunshine! Happy Birthday!